Discussion in 'Completed Games' started by Jestereir, Jul 15, 2015. DELETE is a horror-esque puzzle game that features a young boy named Zai. 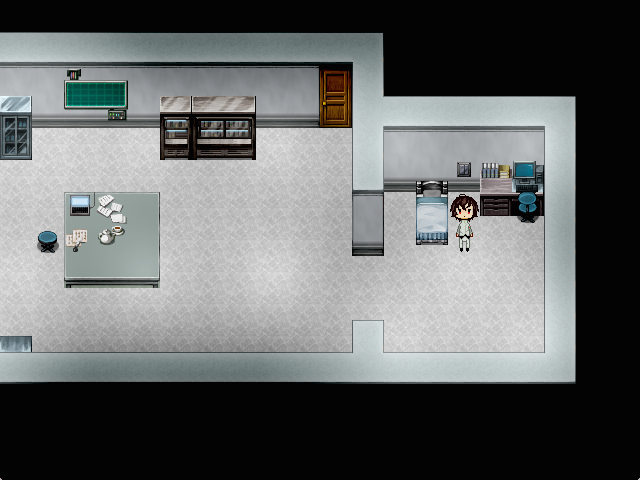 Waking up in an unfamiliar room and no memories to boot, he wanders around the rather abandoned facility in hopes to regain his memories. Before he can even leave the room, he crashes into a mysterious girl that insists on him not leaving, and consequently decides to follow him when he refuses to listen to her. 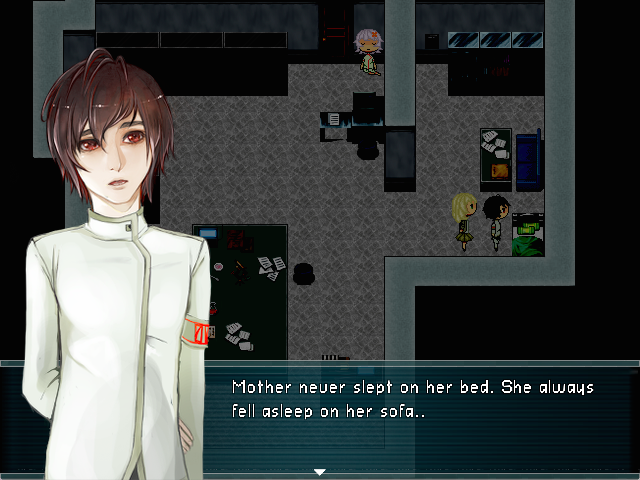 Play as Zai and help him regain his memories, for better or worse. 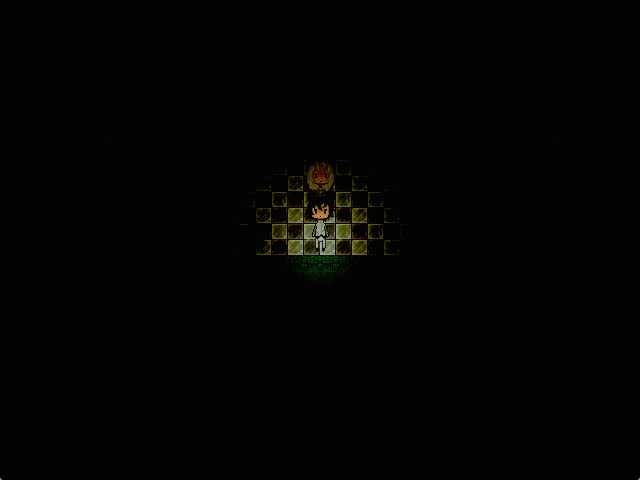 - Horror-esque gameplay. The parts with horror can be avoided if you choose certain paths. - Four endings! Two bad endings, one good end and a true end. Two of the endings can be attained without having to go through the horror parts. - A relatively short game, planned to be around an hour or so worth of gameplay. This information and more can be found in the readme located in the game file. Due to popular demand, here's a walkthrough link! Thank you for viewing, and we hope that you enjoy the game! Note: I would prefer if this is not shared on Tumblr. Anything else is fine, though. Juanita Star, InkPotion, devilshock and 5 others like this. It's a very good short game, took me around 25 minutes to finish it. I got good and bad ending but I suspect that there's a hidden third one aswell, the art and the custom sprites are very nice and the story is intriguing enough. I didn't catch any bugs so far, the only weird thing that happened was when Fae leaves the party and I have to find the connector. After she leaves I read one of the books in the Archives room and Zai realized to be an android but was still talking with her about it (despite her not being in the party), you should disable that dialogue if the player reads it when she leaves. For the rest, it seems polished and very well made, the music and the atmosphere are very good aswell and the puzzles weren't too hard or frustrating. I'll try to find this third ending soon, I'm sure it has something to do with that door without the doorknob. Good job btw, it's a nice little game. EDIT: I just noticed that there's a walkthrough but I won't use it (it will ruin all the fun). I actually had a chance to play this game, and record it for my channel. All in all, not bad. You put a lot of detail in objects, with different descriptions, which is nice! The art was pretty well done. Sadly, I wasn't able to finish it from stupid mistakes I've made. This was amazing. I loved every minute of it! A playthrough of it will appear shortly on https://www.youtube.com/user/StringcraftGaming/videos. Thanks for such an amazing game! That was a good one.I enjoyed the true ending! So again I have to say that I loved playing this game. The art was gorgeous and a huge factor, the game overall was just really really great to look at. I thought it was exciting that you added the locked folder, I actually replayed the entire game (I didn't extract the game so my save files did save) just to get the password because the art was so beautiful. I also thought the story was really well thought out. I did the endings in order and seeing the good/bad ending definitely made me more want to go back and finish the true/fake ending because it hinted at those parts of the story that weren't revealed. I also really appreciate your attention to detail but it was also a clutch for me. I definitely had to reference your walkthrough (which as someone said had inaccuracies) And my only thing is that most likely without your walkthrough, most people won't get the last two endings which is so sad because they're so good! Since you can interact with everything it get's rather overwhelming at a certain point to try and go back and find those extra parts, but again it was certainly worth it. Overall I hope this game gets recognition because it is so impressive, beautiful and nuanced and is just really nice for taking your time and enjoying a story. I also thought it was cool that you didn't have to experience the gore if you avoided the true ending. I quite like this game, even though I don't think it was really that much of a horror. The story is quite well done, with just enough intrigue. It was pretty obvious from the beginning that Zai was an android or something equivalent. I also felt that Zai accepted the fact that he was an android far too readily. The artwork is gorgeous. Even though I don't really like the sprites that much, it was suitable for this game. Sometimes I feel the room was too dark (can't always find the light switch). Good choice of music there to add to the atmosphere. The extra sketches were a nice addition as well. 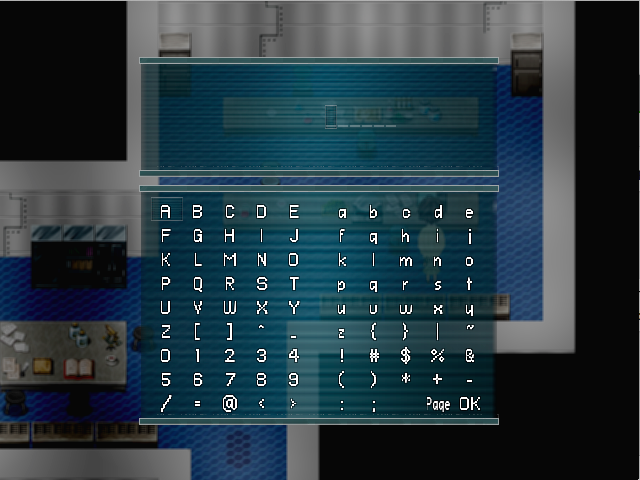 Although all endings were accessible from a certain part of the game, it at least encouraged players to replay the game and see all the endings. Jestereir, Marsigne and Dalph like this. Thanks for playing my game though, I really appreciate your feedback!!! Ah, thank you! The amount of videos people have made for this small game of mine has really exceeded expectations, I didn't even think anyone would do a playthrough of it in the first place! Thank you, I pride myself to .. at least, attempt to put descriptions on all of the items :"D And yes I will relay that to my artist! Whoa that's really cool thank you so much ?? Ahh.. I see! I can't really reply to your feedback word for word, so I'll say this. Thank you for the advice!! The interaction part, hmm.. maybe I could cut it down next time. Several people do like the fact that every object has an interaction to it, but I'll take your opinion into account too! Yeap, it's barely horror actually-- but to each his own. One of my friends was terrified by the slightest sounds, so I left it as horror-esque just to be safe! The artwork is amazing, goodness my artist is amazing. I will definitely relay that to her! Ahh, the atmosphere is supposed to be relatively dark, but I suppose I could make it a bit brighter next time.. hm. And yes! The extra folder was a way to reward the people that paid attention to my readme file and got all the endings, so I had to implement it. I can't get into the mother's room....? I have the room key and all but I keep getting killed when I try and go in..